It was a glorious day for a teddy bears’ picnic for our Nursery children, their families and, of course, their favourite furry friends. The party made their way from the school playground and into Walsall Arboretum in glorious sunshine this afternoon. Children each had a perfectly themed teddy bear box filled with teddy bear shaped crisps, a teddy bear shaped sandwich and a teddy bear shaped shortbread biscuit. They all brought a teddy with them from home and parents who were able to, joined us for the picnic and play time. Bob, the Hydesville bear who belongs to Mrs Whitehouse, was guest of honour at the special event. 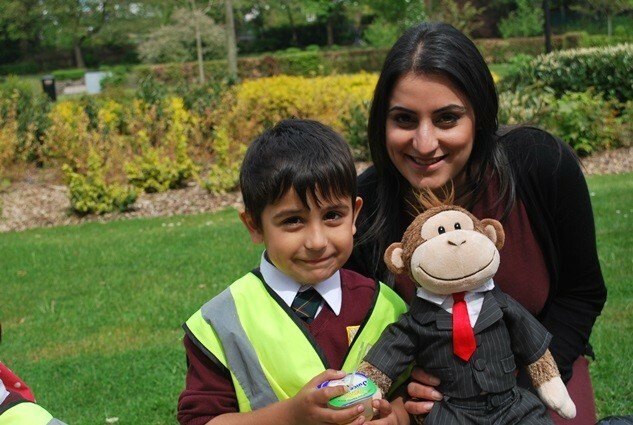 He helped Mrs Whitehouse pick his favourite teddy bear among the children’s teddies and Jayden (pictured above with Mrs Sunar) was the winner. Jayden’s bear was wearing a similar suit to that seen on Mr McGinnes and he was presented with a gift voucher to spend in The Bear Factory.